Well, today is the vigentennial anniversary of my birth. 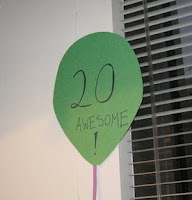 That's right, in case you haven't yet heard, I'm 20. I've gotten about twice as many Facebook wall posts as last year, either because I know more people, because the people I know care more, or because 20 is more of a milestone than 19. There are obviously some who would argue that 20 is not nearly as much of a milestone as 21, but I respectfully disagree. Teenagerhood, whether we like it or not, is something that becomes a part of us. Although it never really leaves, it's sad to say that it technically is no longer there. Is this making sense? or am I already going senile? Twenty-one, although special, has no such significance. It seems that 18 and 19 are the "last hurrah" of adolescence that mesh into college life. And although, even after reaching this age, some continue to act as though they are about four years old, sooner or later, the expectations of adulthood arrive. The number 20 is indicative of that change in my eyes. It comes with the "2," I suppose. Of course, I'm not bitter or mopey. Rather, I'm excited for what my third decade has in store for me. All of you who are older, and I'm sure many who aren't, know that there's a lot which typically happens between 20 and 30. I eagerly await the challenges ahead, as well as that which will come as a result of finally overcoming them. Today was a rather ordinary day. I got that haircut that I mentioned yesterday, but not after going to the grocery store with my mother. We got some much-needed foodstuffs, then she sent me off to get milk and said she'd meet me by the cake mixes. After waiting there for quite some time, I went and found her buying my birthday card. Silly mother. After having stayed up for most of the night doing what seemed to be an inexorable amount of homework, my brother basically crashed and slept until it was time for dinner, which was celebrated by my immediate family as well as my local grandparents at Outback Steak House. I suppose that's been a sort of tradition for my birthday (compared with Barb's family's Christmas Eve tradition). But it really isn't. I just like their food, and seems I either pick there or the Olive Garden for my birthday dinner. I distinctly remember that three of my last seven birthday dinners (including tonight) were held there, two at the Olive Garden, one at Mike 'n D'Angelo's Italian Restaurant, and one (last year) at the Schenley Café in the William Pitt Union. I'm glad to be with family this time around. Afterwards, we all went to my house, where I opened cards, and we attempted, with varying degrees of success, to stuff in some cake and ice cream. "Happy Birthday" was sung to me in the key of B, which was rather high, as my family didn't take the pitch I suggested in quite the way I'd expected. Now, my mother is sitting downstairs, half-asleep, watching my Christmas present, Harry Potter and the Order of the Phoenix (2007), which she has implored me to let her watch almost nightly since I've opened it. Apparently she wasn't with us when I saw it. All in all, my twentieth year has been a good one. And I thank from the bottom of my heart all those who have wished me well in ushering in my twenty-first. 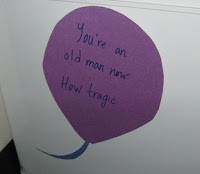 I think there are about 49 of you who've wished me a Happy Birthday in some form or another. Thank you. I really appreciate it, and feel quite loved. Random tangent: My brother felt the need to point out the beer section of the menu at dinner tonight, making fun of me for not being able to have any. I then pointed out that he's 15. Silly David. haha. i like the random tangent. no it didn't. this girl in my english class was eating spaghetti during class time on friday and i realized i really wanted spaghetti. I don't know where I was on your birthday that I didn't comment on your facebook, I have been severely lacking in tha happy birthday department, ah well, you know I love you, Happy Birthday!